20 Million Gallons Later, UCLA Water Main Finally Plugged : The Two-Way The 93-year-old main burst earlier this week, spewing water into a parking garage on campus. 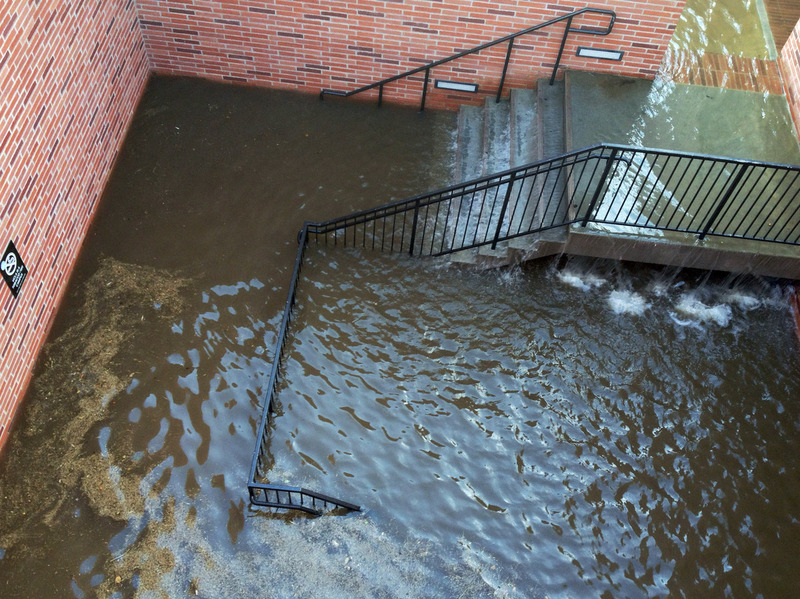 Water filled the stairs to a parking structure adjacent to the main entry doors of Pauley Pavilion, home of UCLA basketball, after a 30-inch water main burst on nearby Sunset Boulevard Tuesday. After 30 hours, work crews have finally succeeded in shutting off the last of the water that gushed from a broken water main near the University of California, Los Angeles campus. There was so much water that police and fire teams had to rescue people from underground parking garages that became flooded by the estimated 20 million gallons that spewed from the 30-inch pipe. Albert Rodriguez, a spokesman for the Los Angeles Department of Water and Power, said the main was completely shut off at 9 p.m. PT on Wednesday, according to The Associated Press. Rodriguez said repairs are expected to be finished late Friday or early Saturday. "At its peak, water was gushing at 75,000 gallons per minute out of the riveted-steel pipe, and by Wednesday afternoon it was still spewing 1,000 gallons an hour. "Rodriguez says workers had a giant inflatable plug at the ready to stop the flow, but it wasn't needed. "The break in the 93-year-old pipe left a swath of the UCLA campus including its basketball arena swamped with water." Drought conditions in Southern California have led government officials to begin fining people for using too much water, a fact that struck many as ironic given the water main break.